Phill became a familiar face when he started as team captain on BBC2’s Pop quiz Never Mind The Buzzcocks in 1996, which went on to run for 19 years. Aside from Never Mind the Buzzcocks and live stand up shows all over the UK, he also appears as a regular guest on QI (BBC2) and Alan Davies As yet Untitled (Dave) in 2012 returned to television stand-up for the first time since 2000 with an appearance on Live at the Apollo (BBC1). On BBC Radio 4 Phill is a regular panellist of the award winning I’m Sorry I Haven’t a Clue and The Unbelievable Truth and was resident curator on The Museum of Curiosity. In addition he has presented numerous radio documentaries including, Phill Jupitus’ Comic Strips, Calvin and Hobbes and The Man Who Bought Hendrix’s Stage. In his theatre work Phill has most recently appeared alongside Jason Manford in the 2015 UK touring production of The Producers as Franz Liebkind. In the winter of 2014 he appeared in the West End production of Urinetown in the role of Caldwell B. Cladwell at the Apollo Theatre. 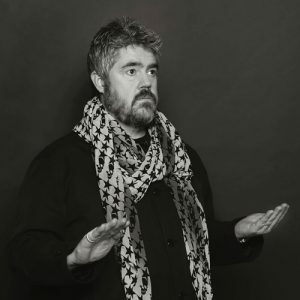 In 2011 Jupitus played King Arthur in the UK and Irish tour of Spamalot and he starred in Red Ladder Theatre’s ‘Big Society’ for 19 nights at the Leeds City Varieties the following year. Phill made his West End singing debut in the autumn of 2009 Phill playing Edna Turnblad in the hit musical Hairspray at The Shaftesbury Theatre, receiving critical acclaim for his performance. Phill is 53 and lives by the sea in Essex (but real Essex, not the one on telly). This entry was posted in 2016, Uncategorised by Toby. Bookmark the permalink.